I am going to elaborate on the exhibitat (that is to say, both an exhibit and habitat) entitled ‘Make Kin Not Babies!’ – A Practice. It was created by the Marek Susdorf* p(art)nership and displayed at the Centre d'Art Santa Mònica in Barcelona, Spain, in November 2017. To describe properly this colla(rt)boration, we need to implement some new concepts into the course of this text. It will enable us to embrace the complexity of the ma(r)teriality of the object of our analysis. In addition to that, the ethics of humbleness, an idea of great importance to understanding the co-production of our artwork, will be introduced and fleshed out in a further section of the article. Now, it is time to have a look at the exhibitat itself and then to comment on what we wished to express through it. Let us begin this short analysis with an explanation that the use of the plural pronouns referring to the authorship of this artwork is not a form of a rhetorical device. Quite the contrary. We want to highlight that our constallation (i.e. an artistic installation and a constellation at the same time) epitomises a tangible tangle of intellectual work, emotional commitment, care and literal corporeal intimacy between many actants, both human and nonhuman, in the machinery of this artistic act. We strongly emphasise that we, as a many-headed agential hydra being behind this artelation (i.e. artistic relation), wanted to avoid the hierarchical oppositions of the artist/tools/object triangle. Instead, we claim that all of the parties here consider themselves equally artists, tools and objects of this interinfluential artistic experience. It is crucial to take it as the point of departure of this analysis. Our exhibitat, as an embodied idea of living-with in artistic practice, is permeated with this premise. We, thus, decided to work colla(rt)boratively on the subject of our artistic exploration by shifting the hierarchical opposition between the artist and his (sic!) objects. People, let us harangue them for a while, need to sensitise themselves to their everyday entanglements with the non-human world, to this unceasing train of connections with other spacetimematterings (be them animals, plants, mushrooms, crystals, the elements, objects etc.). This will allow them to unravel the monolithic perspective of one objective and universal human and male Subject, which is still predominant in the way the so-called reality is conceived. Let us emphasise that in the mainstream narrative, an artist is seen as not only a manufacturer but also a creator, overgrown with myths of self-independence, whose task and privilege is to symbolically animate his (!) objects in the image of God – him(!)self. Tellingly, the words ‘art’ and ‘artificiality’ both stem from the same Latin root. That means that being an artist is not only being one skilled in fabricating objects but also standing in opposition to what is conceptualised as nature. Viewed in this deceptive narrative, an artist is seen as an autonomous and god-like (and assuredly ‘human’, since art is another of the X factors legitimising people’s anthropocentric hubris) construct, exterior and superior towards his tools, surroundings, objects and others of any kind. Through this artwork, together with my co-actans, we wanted to oppose this mendacious narrative and show that an artist is an ideological smokescreen covering the utter non-autonomy of the so-called human and his full dependence on others. Never are we sole creators of ‘our’ creations. Quite the contrary, we are always fully dependent on, and, in fact, subordinated to, numberless miscellaneous factors, conditions, spatiotemporal dimensions, both human and nonhuman as well as both sentient and non-sentient (whoever knows where these borderlines lie!) others that together with us shape the results of our praxis. To mention that the number of bacteria on my palms was crucial at a certain point of the creation process of our exhibitat is not only a description of an artist’s experience. It is a political statement. And later on we are going to explain why. Firstly, let us devote a moment to present the baby-like shape of the agglomera(r)t which is, of course, not without significance here. 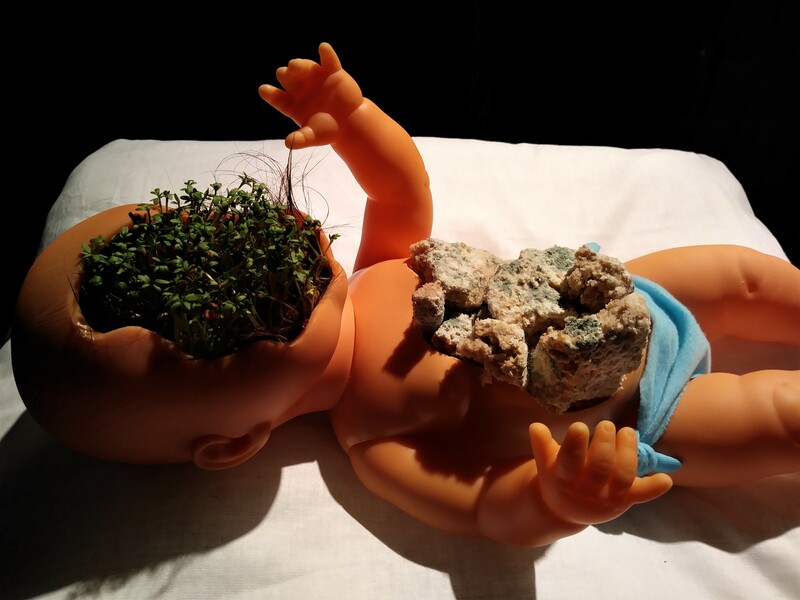 The piece is a direct reference to Donna Haraway’s plea to ‘make kin not babies’ coming from her recent manifesto ‘Anthropocene, Capitalocene, Plantationocene, Chthulucene: Making Kin’ (Haraway: 2015). In her call, Haraway tries to shift our anthropocentric pro-genealogic metanarrative and points at the re-generative ego-linearity of human reproduction. Making kin, contrary to making babies, is focused on more horizontal and bifurcated perception of the ‘reality’ and prompts us to bond with our non-human allies. The strategy strikes at the heart of the anthropo- and androcentric reprocentric narrative, which is established on the ideological importance of heritability in both of its meanings: the biological congenerical mirror-fixated self-replication of homo sapiens and the accumulation of patrimonial symbolic and material capital. The strategy also opposes the phallocentric objectification of women seen as naturalised de-subjectified child-makers. Finally, making kin calls for full recognition of our (in-/a-/non-/ex-)human others which we constantly meet on our way and thanks to which we manage to endure and create. All of this, and particularly the call to inter-recognition of our others, was of high relevance to the co-creators of this compos(t)istion (i.e. both compost and, obviously, a composition). The exhibitat consists of two main actants: garden cress (Lepidium sativum) and mould. The garden cress was planted on my own hair and taken care of very solicitously and meticulously. I refer here to Teresa Murak, a Polish artist who in her exquisite and inspiring works also uses garden cress and experiments with the boundaries of a potential human-plant encounter. I would like to draw particular attention to her performances from 1989 (Orońsko, Poland, and Berlin) and 1991 in New York in which Murak lies inside a bathtub filled with water and garden cress seeds and remains there invigorating germination. She literally becomes soil-like here, she gives her warmth and care to Lepidium Sativum in order for it to grow, to live, to self-create. In this case, it is almost impossible (and would be utterly unnecessary) to tell the artist from the artwork, they are inseparable: a plant-human – this is what we are dealing with here. No longer is the artist herself a master of her artwork; instead, the results of this mutual becoming are written zoegraphically (Hengel: 2012), which emphasises the role of collaborative work through intimate communing with our others. Therefore, not only does Murak stress the perpetual plant-human interdependency, the unceasing conviviality of ours, but she also shifts the great hierarchy of anthropocentrism which has always resulted in the total exploitation of the world of vegetal others. The mould part of the artwork represents the circularity of life and death, a view in which a singular, individual death (the bacteria in the sourdough starter we prepared died when our bread was baked in an oven) becomes less valuable and the perpetual atoms circulation is emphasised and glorified (thanks to the death of the bacteria we created a perfect habitat, i.e. bread, for mould to grow and to self-create). The co-production of the mould of the exhibitat was pretty complicated. I decided to follow a recipe from Michael Pollan’s Cooked. A Natural History of Transformation (Pollan 2014, 427-433) and create a loaf of bread without using commercial yeast. In order to do so, with my human and non-human allies (including warmth, the Sun and several glass and metal bowls) we spent three weeks making a leaven out of different types of flours, some water and bacteria that lived on my palms and in my surrounding. The number of the last-mentioned, I repeat, was crucial for the whole process. I mixed the ingredients according to the recipe and then the wild yeast and bacteria began to consume the sugar in the flour and to ferment. It is needless to say that the whole process takes a lot of time, care and caution in order to yield anticipated results. After the bread was finally baked the mould started growing on its hunks around five days later. All of the aforementioned stages of the whole process took place in Bologna, Italy. Then the elements were transported to Barcelona, Spain, where the exhibitat was assembled and displayed two days later. In total, it took us two months to compose the final look of our concartedness: this artistic concertedness. It would not be possible to create this artwork without the employment of what I call the ethics of humbleness, that is to say, both careful and caring approaches towards the objects/other subjects of an artistic exploration. Contrary to the predominant anthropocentrism and its hubristic, exploitative, arrogant and ego-centric politics of learning, grasping and exploiting, which we have already discussed, the ethics of humbleness exhorts us to leave the throne of the alleged human primacy and to abandon ourselves to the subject-objects of our artistic or scientific practice. What then should be emphasised here is the demand to become more vulnerable and always ready to be extruded from our ‘human’ safe position, which now is constantly stabilised by the force of “eliminating or dominating what it takes to be the other, the non-I” (Barad 2014, 169). The ethics of humbleness makes us, humans, act in the opposite way. It prompts to recognize the others and to elevate them in order for us to eliminate our political exceptionality and to open us to the needs of our others. And precisely this is why I feel it is pivotal to explain once again to my human kin that this artanglement is an effect of a symbiotic colla(rt)boration of legion agencies, entities, actants, identities, phenomena, environments, conditions, times and spaces. The authorship of this work is, thus, limitless (hence the asterisk following my surname) but to translate this complexity to my co-humans, I will try to name some of its authors. Thus, I would like to express my gratitude to my main co-workers, the garden cress and mould, which let me experiment with them. I am also thankful to the growth-propelling Sun in Bologna, to my Mother in Poland who provided me with Lepidium Sativum seeds, to my partner Karol Andracki who shaped with me these beyond-human ideas on a September night in Helmond in the Netherlands, to my Italian friend Barbara Ferriani for her help and extraordinary ability to put up with my ideas, to beautiful and warm-welcoming Barcelona where the exhibitat was displayed. To water, bacteria, flour, ideas, memories, air, plastic, glass, hope, warmth, time, space and matter and all the rest that enabled this artelational holobiont to self-create. Finally, through our conca(r)tenated/-ing work we would like to draw attention to the materiality of our artistic exploration. Our main aim was to point at the entanglement-like process of any kind of (not only artistic) production, which strikes right at the heart of the arrogant pride of purported self-reliance and independence that humans (and human artists especially) often fall prey to. Making kin seems to be a great solution to recover from this foundational anthropocentric ill. Haraway’s politics, applied also in artistic practice, makes us more cautious and careful while approaching our others. It also pushes us to create more kinds of new fruitful consaguineous ma(r)terial assemblages of mutual non/human commitments. Barad, Karen. ‘Diffracting Diffraction: Cutting-Together-Apart.’ Parallax 20 (2014): 168-187. Haraway, Donna. ‘Anthropocene, Capitalocene, Plantationocene, Chthulucene: Making Kin.’ Environmental Humanities, vol. 6 (2015): 159-165. Hengel van den, Louis. 'Zoegraphy: Performing Posthuman Lives' Biography: An Interdisciplinary Quarterly, vol 35, no. 1 (2012): 1-20. Pollan, Michael, Cooked. A Natural History of Transformation. London: Penguin Books, 2014. Marek Susdorf. Polish writer and feminist publishing in Polish and English, currently living and studying in the Netherlands; interested in literature, art, musicology and philosophies of new materialism and the posthuman.